Thanks (or no thanks) to the Fast and Furious trilogy, now everyone is all crazy about turbo and nitrous oxide. Driving a turbocharged Toyota Vios myself, I often wondered what would it be like if I did not charged the car instead and went down the route of installing a NOS kit. Well, I was fortunate enough to be able to gather and compile a huge library of dyno charts of various Toyota Vios that are either turbocharged or has a NOS kit installed. Hence, I would like to provide a compilation of those dyno charts to be shared here and a overall dissect as well. Let's take a look at the various dyno runs of Toyota Vios with a turbo kit installed. All cars are running stock automatic transmission and the boost setting is set between 0.5 bar to 0.6 bar. 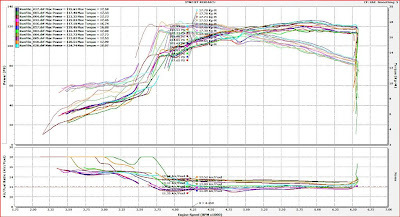 The chart above shows nine dyno runs from different Vios, the average horsepower produced is between 130 PS - 140 PS and the average torque produced is between 17 kg-m to 18 kg-m.
Now, let's take a look at the various dyno runs of Toyota Vios with NOS kit installed. Identical to the setup of the Vios turbo, all cars are running stock automatic transmission and utilizing the same nozzle size as well. 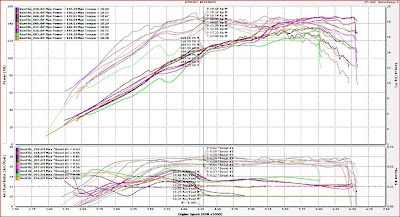 The chart above shows eleven dyno runs from different Vios, the average horsepower produced is between 110+ PS - 120+ PS and the average torque produced is between 16 kg-m to 17 kg-m.
Let's focus on the torque here instead of just horsepower alone, after all torque is all that matters when we are in for some spirited driving on the streets. 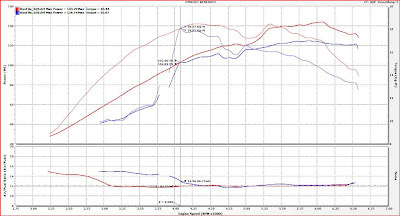 Looking at the NOS dyno chart, the triggering of the NOS is at around 3,500 RPM and the torque readings surged all the way up reaching 17 kg-m at the 4,200 RPM range. For safety reasons most tuners will advise the spraying point of the NOS to be at a minimum level of 3,500 RPM and above. Although the peak horsepower produced by the NOS kits is significantly lower compared to the turbocharged Vios, both cars achieved almost the same figures around the same RPM range. In order for the NOS equipped Vios to maintain power throughout the range, the spraying of NOS was maintained until RPM cut off. Let's take a look at a dyno run between a Vios turbo and Vios equipped with a NOS kit. As you can see the figures for both the cars crossed path at around 4,000 RPM, and anything after that is history for the NOS. Having said so, I'm not saying the NOS is bad nor I am against it. In reality, the NOS kit actually has the best bang for your dollars in terms of power gains as a typical standard NOS kit costs around RM 3,000 - RM 3,500 and it gives you the power close to a turbo car. The only catch is that nitrous oxide refills don't come cheap, once you run out of laughing gas a typical refill will probably cost you between RM 180 - RM 200 depending on your refilling location. So the choice is yours, if you're looking for some occasionally spirited driving without the hassle of bolting on a turbo kit and running all sorts of piping across the engine bay then the NOS kit is for you. It's clean, simple and straight forward and it gives you the power you need by a simple flick of switch or a press of a button. Just remember that the catch is that you will have to refill once you run out of laughing gas. And if you're a more spirited driver like myself and you require constant power most of the time, then the turbo kit is for you. Think of it as you have unlimited supply of nitrous oxide in your car, of course the price to pay for it will be much higher compared to a NOS kit. End of the day, the same principle applies regardless which route you're taking. Being reasonable and having a balanced tune is key to reliability of your engine and drivability of your car. Going blindly and solely just for the horsepower figures alone is shallow, you don't want to be a dyno whore. Cheap and reliable won't be fast. yo man, glad to see you modding your car man. im using an activation switch for my nitrous kit at the moment, and its activated via the TPS for safety reason bro.